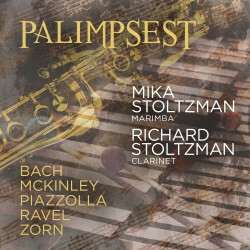 Clarinet legend Richard Stoltzman and virtuoso marimbist Mika Stoltzman arrive on AVIE with a stunning collection of works in which the duo finds freedom in music of the past and equally breaks through boundaries with new arrangements and commissions. John Zorn’s title track, Palimpsest, written in 2018 for Richard’s 75th birthday, sets the tone, evoking layers of tradition and innovation. Richard’s lifelong friendship with William Thomas McKinley led to the jazzy collection Mostly Blues, three of which are performed on this album. The musical meat of the album are the couple’s own arrangements of monumental works by Johann Sebastian Bach – Mika’s solo marimba take on the Chaconne from Partita in D minor originally for solo violin, and Richard’s colourful Chromatic Fantasia for solo clarinet and Fugue, BWV 903 bringing him together with marimba and bandoneon. The versatile Mika, who has collaborated with such musicians as Chick Corea, Eddie Gomez and Steve Gadd, also provides a jazz-tinged duo arrangement of Maurice Ravel’s Pavane pour une infante défunte, and the album takes a side trip to the Argentinian world of Astor Piazzolla with a solo clarinet version of the composer’s Etude No. 5, and the full complement of musicians coming together for Fuga y misterio.